Our New Zealand & Australia Travel Specialist, Lauren, recounts her recent experiences in New Zealand’s Christchurch and on board the TranzAlpine train. When you hear the word Christchurch, it’s hard to not think about the devastating earthquake that hit in back in February 2011. Today, the city is rebuilding and it is still a fantastic place to visit. The tram is back up and running, the Restart Mall is a great concept of shops within shipping containers and there are some fantastic art projects and gardens dotted around the city to fill the space left by the earthquake. The locals now have a blank canvas to build a new city from their ideas – where else can that be said? Although initially I was moved and shocked to see the difference in Christchurch’s previous business district from when I previously visited the city, I was left feeling inspired by the Hassle Free Tour bus. You get a great insight into the city, its history, and plans for the future. We stayed at the award winning boutique hotel, The George, which overlooks the beautiful area of Hagley Park and the River Avon. It’s in a fantastic location and I highly recommend a walk through the Botanic Gardens. From Christchurch, you can visit the local wineries and Pegasus Bay is highly recommended for fantastic wines. Take a day trip to the romantic Akaroa Peninsula, or hop on one of the world’s great scenic railways – the TranzAlpine. 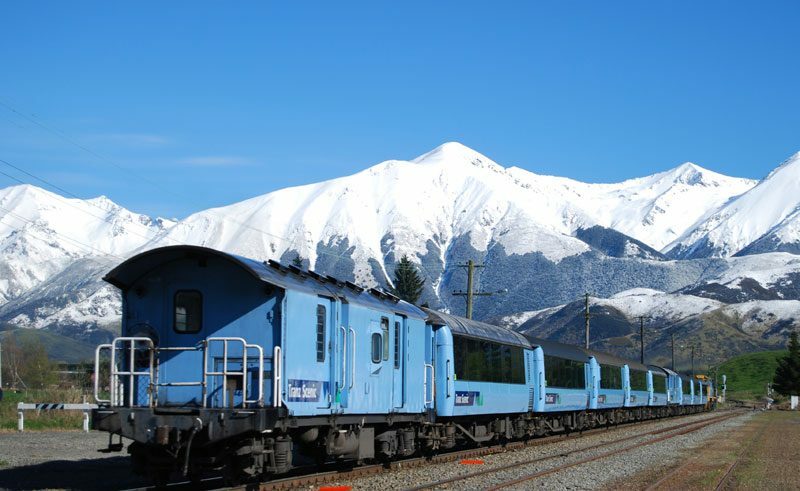 The TranzAlpine train runs from Christchurch on the east coast of South Island across to Greymouth on the west. It’s a spectacular journey which traverses the Southern Alps, crossing the farmlands of the Canterbury Plains – the views at every turn take your breath away! The train itself is extremely comfortable and has large unobstructed windows so you aren’t clambering to get a good view. You can also visit the front carriage which has open air windows for uninterrupted photo opportunities. The staff can provide you with headphones so you can listen in to the running commentary, and there is also an area to purchase snacks and drinks for the duration of the journey. This 4-hour-trip is a great alternative to driving, but as the route goes via Arthur’s Pass (where you could stay overnight), you can extend the pleasure and really experience a remote area surrounded by snow-capped mountains. There are some fantastic walking trails, or you could just sit back and enjoy the nature and silence that surrounds you. 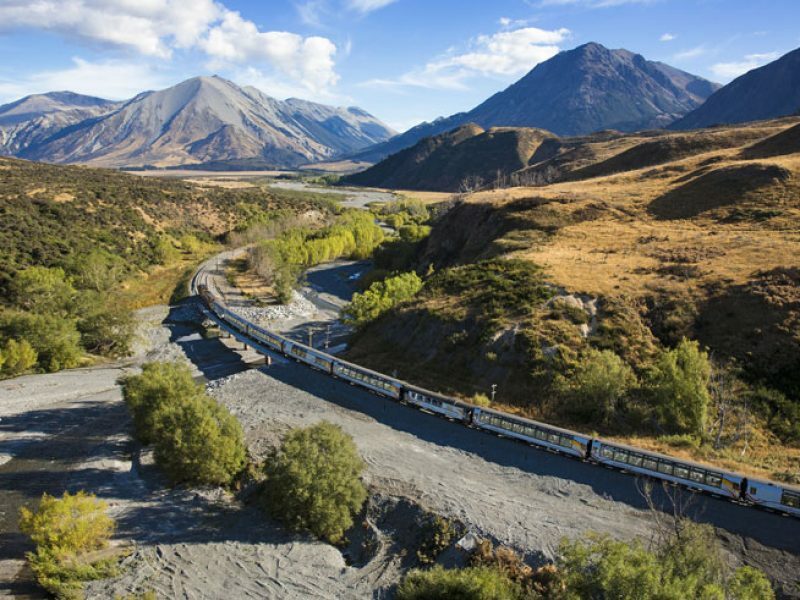 The TranzAlpine is one of the best train journeys in the world and a great way to discover more of New Zealand’s South Island!